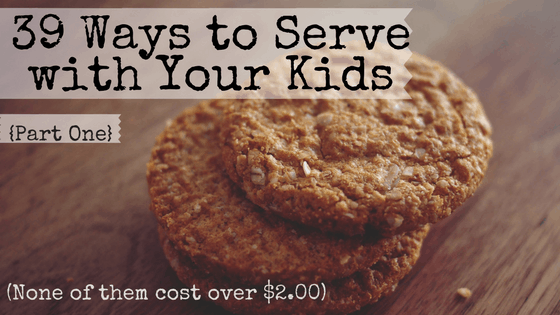 This is the first post in a three-part series about ways to serve with your kids. You can read the second post here and the third post here. If you’d like a free PDF of all 39 family service projects, sign up at the bottom of this post, and it will be sent right to you. I have a love/hate relationship with mission trips. There are so many lost and broken people around the world that don’t know the amazing love of Jesus and His salvation. So I love that there are missionaries doing going out to do that good work. And here’s where people start to boo me. The part that I hate is that there are people right here that need to know about that amazing love too, and many Christians aren’t sharing it. I’ve seen so many people get pumped up about going on a week-long mission trip when they literally don’t know their next-door neighbors. They’ve never taken the time to minister to the people that God has placed in their back yard. And the other thing about foreign mission work is that it’s not for everyone. God didn’t call us all to be foreign missionaries. Finances aside (because let’s be real – mission trips are expensive), being a foreign missionary is a very specific calling from God. Sure, it sounds great to say that you went on a week-long mission trip to Wakanda to help the orphans and dig water wells and clean up from the disaster. And the trip was probably great and lots of love was shown and lives were changed. But equally important (and perhaps more valuable for our own spiritual development) is the daily work of showing selfless love to our own communities. Let’s teach our children to serve right where we are. Let’s not make service about raising money to go abroad to help strangers. Let’s make service such an integral part of who we are that our kids think it’s totally normal to spend part of every week serving others. Here are the first thirteen out of thirty-nine ways to serve with your kids. But one more thing before we dive into this list – make sure to talk to your kids about why you’re doing these things. Print the list and let them choose which projects to do first. What may seem easy to you may be scary to them. Depending on their age, this may be a difficult transition for them. If you’ve never practiced this sort of mission hospitality with your teenagers, they might/will absolutely make this difficult. But part of being a good parent is being deliberate about parenting. We’ve got to make conscious choices about how we spend these limited years with our kids. So even if they resist at first, lean into it. This is worth the effort/fight. Make some of your famous homemade chocolate chip cookies or bake some of those delicious place and bake cookies from Nestle Tollhouse. Or just grab a box of Cosmic Brownies and give each neighbor a pack. They’re so delicious no one will complain that they aren’t homemade. The method of dessert making isn’t important. Package them adorably, or just throw them into Ziplock baggies. The most important thing is that you deliver them to your neighbors. Introduce yourself and let your kids introduce themselves (this is a great learning opportunity for kids). Invite them to your church. Offer them a ride or just offer to save them a seat in the sanctuary. Find out if they have a need that your family can meet with love. Once you’ve met everyone in your own neighborhood, go to another neighborhood. Go to a not-so-great neighborhood and get to know those people as well. Jesus wasn’t too picky about who he served. This post, 39 Ways to Serve with Your Kids, contains affiliate links for your convenience. 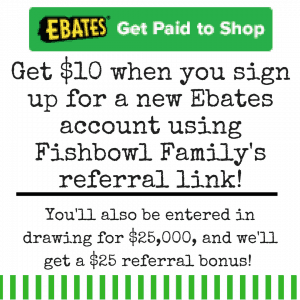 This means that if you click on a link and make a purchase, we’ll receive compensation. This won’t cost you any extra money. You can read our full disclosure policy here. If there’s an elderly person, single mom, or overworked dad who needs a little help, offer to do it! The best way I’ve found to do this is to just show up with all your yard stuff, ready to work. Once there, ask them exactly what they’d like you to do. If you live in a neighborhood where everyone is able-bodied and has perfectly manicured lawns, go to another neighborhood. This one is super easy for kids to do all by themselves. After the trash men pick up the trash, have your kids pull everyone’s cans back to their house. If you have competitive kids like mine, they will make it into a contest to see who can get the most cans in the least amount of time. Remind them to not get in such a hurry that they destroy someone’s trashcan. The men and women who serve our cities do so at a great personal cost. They have a higher than average divorce rate, work difficult hours, and just generally have very tough jobs. I’m not suggesting that you can bake cookies so good that they’ll save a marriage, but they might redeem a rough day. The mail carrier has a pretty thankless job. He is alone and outside, no matter the weather, all day. The amount of human interaction he has is pretty low. So some Rice Krispie treats or chocolate chip cookies might really brighten his day. As would a sincere card thanking them for doing such a great job. I know my mail carrier has to work extra hard because of all my Amazon Prime orders. It’s the free two day shipping that gets me. Should I load all the kids into the car to drive twenty minutes to the grocery store to pick up the honey I forgot to buy or wait an extra day to have it delivered?? That’s a no-brainer for me. We live in Texas and it is hot outside for a lot of the year. People that have to do their job outside all day have my respect because I can last for about twelve minutes outside before I start to feel like I’m sweating so much I’m at risk of dehydration. Bringing ice cold bottled water or Gatorade to the people picking up your trash is a fantastic way to show God’s love. A bonus that makes this activity even easier at my house is that my kids are already obsessed with the trash men. They love watching them and are thrilled whenever they get to interact with them. You should probably call the homeless shelter first and make sure that this is okay with them. 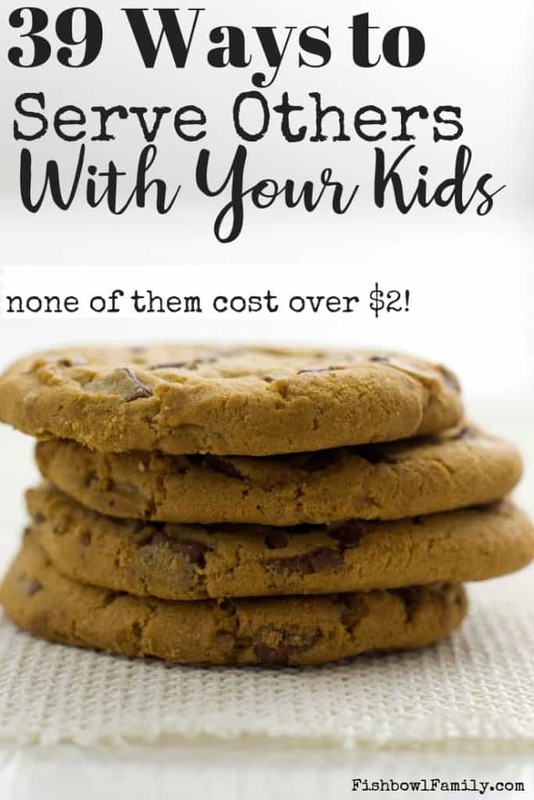 Different shelters/homeless ministries have different policies, but even if they won’t accept free cookies, they probably have some other way you can help. If they say yes, you also might want to find out how many people they have staying there so you can make sure you bring enough treats for everyone. Clean out your game closet and donate any games that are duplicates or that aren’t played very much. I don’t know exactly how this happens, but about once a year our game closet gets so full that games start to fall on my head whenever I open the door to neatly put away cram the sheets onto whatever shelf I can reach easily. Again, you should probably call the shelter to find out their policy for donations. Finding a person you trust to take care of your children is not only very difficult, but also pretty expensive. So volunteer to watch the children of a single mom or a family who is struggling financially. Chances are if the family is struggling financially, their relationship is under a lot of stress too. Having time to spend with their spouse without the kids, could be an even greater gift than you know. We have had families do this for us in the past, and it is always a welcome treat. If your kids are like mine, they will relish the opportunity to have other kids over. It will basically be a playdate for your kids! The food pantry in my town is only open to the public one day a month, but they need volunteers from time to time. The volunteers can sort food, assemble boxes of food, etc. on the days that they aren’t open. On the Saturday that they are open, it is extremely busy and they need all the help they can get. This may seem like a much more daunting task than it actually is. I’ve participated in food drives at both my church and my children’s schools. You will basically talk to the person in charge and tell them you want to do a food drive. They’ll direct you as to what needs to happen from there. Our church does theme months to collect food for our local food pantry. The donations are collected on a table near the sanctuary so that everyone has a chance to see it all month as a visual reminder to grab some extra boxes of macaroni on their next grocery store trip. This is one that my kids love to do because they always try to give away the foods they don’t like. “Mom, we should totally donate these lentils because they’re so healthy and full of protein. This service project also gives you a chance to declutter and get rid of some unneeded items in your home. And although I quit trying to be a minimalist, we still have plenty of items to clean out! You can then donate the proceeds to an organization your family is passionate about. My family loves donating to Water Wells for Africa, Compassion International, Samaritan’s Purse, and Show Hope. Because I didn’t want this post to be too long, I broke it into three posts. You can read the second post here and the third post here. If you’d like to print this, you can sign up for our email list at the bottom of this page, and we will email you a free printable PDF of all 39 ways to serve with your kids. 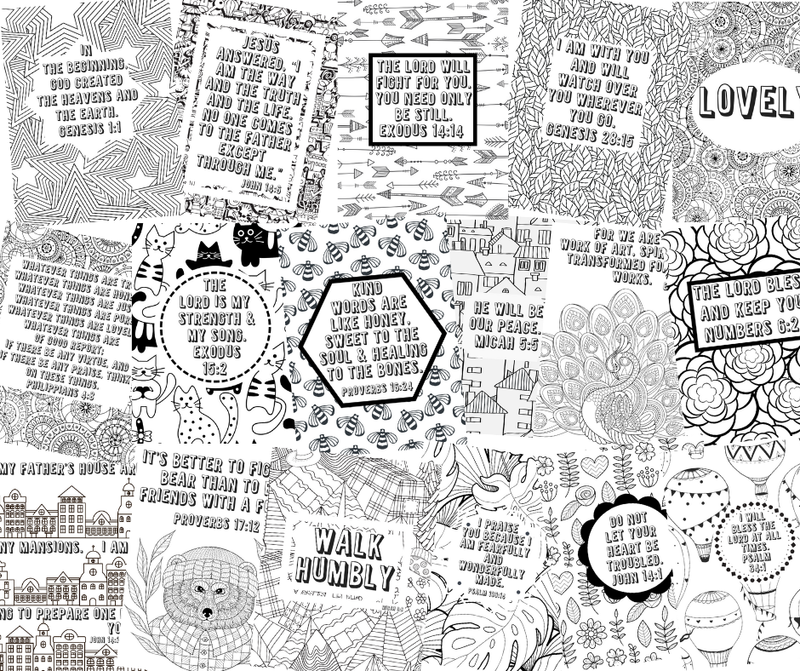 We have the printable hanging on our refrigerator and plan to complete all of them this year. My kids love marking them off the list once we’ve completed them (which is a little ridiculous because many of them are projects that can be repeated over and over throughout the year). Chip and I get a lot of things wrong with our kids, but I think we are getting this right. We are raising them to love to serve others. They don’t expect payment (though they did at first) or reciprocity (though they asked about it). They want to love others and be like Jesus. It’s all well and good to go to church and read your Bible. Do those things because they are good for your heart and soul. But don’t forget to serve. Don’t forget to get your hands dirty and your heart a little broken as you reach out to the broken in your community. What are some ways that you’ve found to serve with your kids? Tell us in the comments! Want to save this for later? Pin it to your favorite board! Love all of these ideas! So easy to do and they make Great impacts to both sides involved. Love how creative you got with these ideas. I’m going to save this list and do some with my kids this summer! I’m glad you liked it! Be sure to let me know which ones went well! Oh, I LOVE these ideas! How I longed for a list like this when our kids were little – this from the mom of the family crew that wasn’t asked back to the nursing home! :-O (But that’s a story for another time.) Funny enough, our teen daughter is on a mission trip this week in Houston, and our family finally settled into a volunteer routine at a homeless shelter. It’s well worth the diligence to continue trying outreaches until finding one that fits the family. Great championing for the Kingdom. Oh my goodness! I’d love to hear that story sometime! Thank you for the encouragement! I love this! TODAY, I am looking for a teen to pick up dog poo for an elderly friend. These are really fantastic ideas, whether you have little kids or not! It has been a very long time since I’ve shown up a neighbors door with some of my fabulous chocolate chip cookies! It really takes so little to express love to the people around us, and often, it speaks volumes to them. Plus, it makes me feel great, too! Actually, I’ve wondered if perhaps I end up feeling even better than the recipient. Kinda makes me think Jesus was right when He said “it is better to give than it is to receive”! Wonderful ideas! Can’t wait for your next posts! Thank you! I tell my kids the same thing about their good behavior helping our whole family. These are such great ideas Halee! Thanks Angie! I printed the PDF and hung it on our fridge, and Brinley loves checking them off of the list because she’s a little list lover like her mama!